When an interlock is triggered, operators within the control room are notified of such events. To remedy these conditions, reliable and accurate information relating to the causes of interlock conditions need to be accessed. Invisible or obscure interlock logic is an ongoing frustration for operators and users, especially during non-steady state operations during start-ups, process upsets and transitions that can impact plant production. A better way of monitoring interlock conditions was required, one that would provide an active view of all interlock information via a single entry point for the entire plant. With direct access to interlock information from the Integrated Control and Safety System (ICSS) in the control room, this improves the interpretation and resolution with access to reliable and accurate interlock information. Yokogawa were able to provide a software solution to address the needs of the customer by developing a dynamic interlock visualization tool to enable interlock data to be monitored and analyzed, helping to resolve interlock conditions rapidly. The interlock user interface provides a general display of the status of all interlocks across multiple plants for a full and comprehensive view of all interlocks. For rapid resolution of interlock conditions, operators are able to access interlock information directly from Human Machine Interface (HMI) screens in the control room that presents real time status capture from the ICSS. The same web based user interface is also available for users outside of the control room e.g. maintenance and engineering teams, with improved visibility of interlock status for all departments. The software provides a clear display of information, making it easy for users to navigate through the interlock data. With intuitive navigation and inbuilt logic in the web display, it easy for operators to drill down into the data for interlocks, actions and initiators to help with rapid resolution of interlock conditions. Within the web display, important equipment and areas can be visually highlighted for easier identification, so that operator attention is focused on the areas of high importance, helping to avoid slowdowns and stoppages in production. This solution also replaces the need for specific custom graphics to be created, managed and maintained. All interlock information is available from the display screen with out-of-the-box functionality with drill down capabilities to navigate through the interlock hierarchy. This is a more reliable and robust approach that presents interlock information to help identify interlock causes and conditions and is integrated with the ICSS, providing more confidence in the information being presented to users. This is an easy to use software tool with a simplified and user-friendly interface with configuration and management capabilities in a single stand-alone application that can be deployed across multiple plants. Improved plant operations through the rapid and reliable access to interlock data in a unified environment. Reduced production delays with fast resolution of production delays and stoppages that relate to hard to find interlock dependencies. Users are able to quickly search and navigate through information that require investigations to have a better understanding and insight to resolve interlock conditions. Effective end user assistance through the faster identification of problem areas to assist operational issue resolution. HMI display simplification - Customized display graphics have a tremendous load on the system, by replacing the existing solution with a software solution it saves time and frees resources. Reduction in preventable shutdowns through the increased visibility of shutdown risks when working on the ICSS or in the field. Planned work with the systems process or in the field is improved by helping to identify the potential risks of tripping or triggering interlocks. Audit trail of all interlock changes to see clearly all changes made to interlocks with user defined areas for change management. There were a number of key areas that were identified to improve interlock troubleshooting and visualization and to remedy the problems with the existing solution. It was important that the solution considered the response time to investigate interlock conditions. It had to improve the resource efficiency and be more dependable and effective than the current solution. Custom interlock graphics are very costly to produce and require ‘ongoing’ maintenance to keep them updated. They are also limited in terms of their functionality and are static graphics that do not facilitate problem resolution. Custom graphics have no in-built functionality and are limited, especially in terms of the drill down capabilities. Yokogawa’s interlock monitoring solution provides an intuitive display of interlock information that mirrors the interlock configuration on the ICSS. 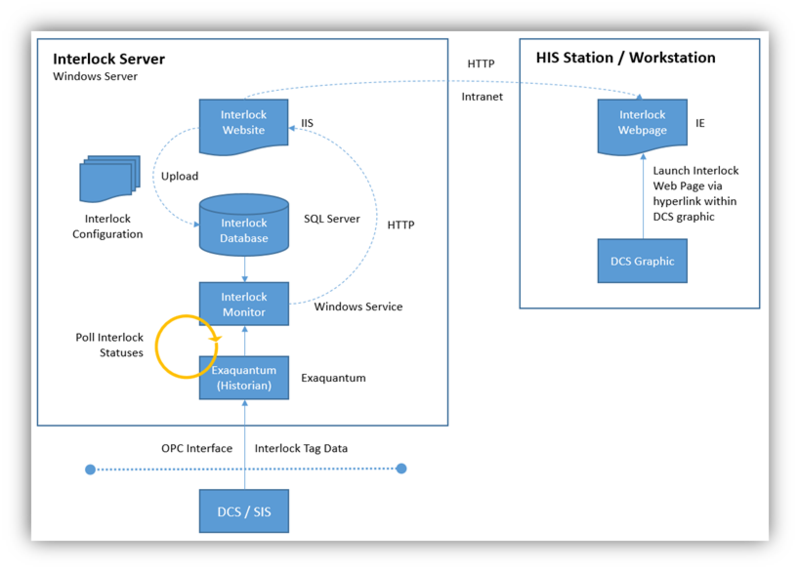 The interlock status signals from the ICSS can be used to update the information presented in the web user interface through an OPC DA connection. This enables tag data acquired through Exaquantum to be monitored and analyzed. The interlock monitoring solution collects and presents tag data for interlocks, initiators, and actions then displays this data to users through a web user interface. The software connects to an instance of Exaquantum, and notifies the interlock monitor whenever a configured tag updates. This enables the web user interface to have access to live data from multiple plants and therefore display a clear status of all configured interlocks in the system. Operators are able to quickly access interlock information directly from the ICSS in the control room, presenting real time status capture of interlock data to help maintain operations with integrated security via single sign-on.